1 Corinthians 14:6-19; Matthew 20:17-28. Fr. Thomas Hopko: This is Fr. Thomas Hopko. I happen to be in Irvine, California, right now, not in Ellwood City, and I’m here at the church and with my good old friend and co-worker, Fr. Steve Tsichlis. Fr. Steve is the pastor of St. Paul’s Greek Orthodox Church in Irvine, California. Fr. Steve also happens to be presently the president of the Greek Orthodox Archdiocese Presbyters’ Council. He does many other things as well. He’s on the board of trustees of the Project Mexico that builds houses for people who don’t have houses and runs an orphanage for boys who don’t have homes. So Fr. Steve does a lot of good things. We’re going to hear about some of them right now. Fr. Steve, tell us a little bit about yourself and your church. Tell us a little bit about where you studied and how long you’ve been serving as a pastor and a little bit about your church right now. Fr. Steve Tsichlis: Thank you, Fr. Tom. I think probably the first thing I should say is that I just celebrated my 25th anniversary as a priest in July of 2008. I had been a deacon for three years before that, [by the hand of] the late Metropolitan Silas of New Jersey. I studied at the University of Missouri. I went to Holy Cross School of Theology in Brookline. I went to Yale Divinity School, and I went to Fordham. Actually, it was at Yale Divinity School, as you may recall, that I first met you, and I had the privilege at Fordham of working with the late Fr. John Meyendorff. I’ve served as a priest for 14 years in Seattle, at the Greek Orthodox Church of the Assumption there, and I’ve been at St. Paul’s now 12 years almost. Fr. Thomas: Yeah, I remember being with you in Seattle. I remember your church very well. Of course, I’ve visited you here at St. Paul’s quite often. I’m very impressed with St. Paul’s Church here. I think it… My impression—I travel around a lot—is that it’s a kind of a unique church in many ways. Why don’t you tell our listeners a little bit about your community here? Fr. Steve: Well, I think St. Paul’s is a unique church because there are so many good people in it, so many people who desire very, very strongly to be Christians, to follow Christ. I just… I don’t know what to say. I have just really wonderful people. St. Paul’s is a parish that was established by the late Fr. George Stephanides, who, at a certain point in his ministry, realized that we as Greek Orthodox were missing an entire demographic of people, people who maybe were Greek Orthodox in background themselves but had married people who were not Greek, and who really could not worship, could not understand our worship being in Greek. So really, St. Paul’s was one of the first parishes in this country to move to an English Liturgy, and I think that has made a huge difference in the parish’s life, because we are a very welcoming community to a broad, broad diversity, a very broad, diverse group of people. I think also we are trying to live the Gospel very concretely by doing good things to as many people as we possibly can. Fr. Thomas: Fr. Steve, I believe that you probably are dealing with about a thousand, more than a thousand people, or more than 400 families, something like that? Fr. Steve: Yes, about 450 families. So I think I did the math once. It’s about 1,000 adults and about 200 children. Fr. Thomas: Yeah, and I noticed also that you have a large school building. You built it; presently, I believe someone has rented it from you, but tell us about your plans for that building in the near future. Fr. Steve: Well, right now we actually are renting that building to a group of Lutherans who wished to start a second Lutheran high school in Orange County, and I’m all for opening as many Christian schools as possible, especially with education in our country seemingly—public education—seeming to go down the tubes so quickly, at least in California. And with the rent that we are receiving from them, I hope in a couple of years, when they’ve outgrown us, we will be able to open an elementary school there, an Orthodox Christian—very broadly based, though—elementary school. Fr. Thomas: Now, in your church I notice that you have a rather large staff, a lot of people helping you. Could you say a little bit about—you might call it the conciliar nature of the leadership of your church? It’s very clear, being in your church, that you’re the pastor, but it’s also very clear there’s a lot of other people doing things. Fr. Steve: And I think that’s really important. I think, actually, as far as having staff goes, I really have to tip my hat to the late Fr. George Stephanides. He really had a vision for having a multiple-staff community, knowing that the more ministry that’s done, the more people will be drawn to the life of the community and to the parish. So we have not just simply myself as a pastor: there’s also an assistant priest, there’s a lay pastoral assistant. Both of them are seminary graduates. We have a wonderful office staff, women who are committed, not just simply to working in the office, but actually taking pastoral ministry, caring for some of our elderly people, just doing an amazing number of things. I have an excellent parish council, a really good parish council, who wants to do what is good and right and true. And I think the priest’s job, primarily, is not to try to do everything himself, because you really cannot; I think that the priest’s main job is to look at his people carefully, pray over them, pray about them, see if he can discern what their gifts are, and call those gifts out of them to be used for Christ’s glory. Fr. Thomas: I also noticed, since I observe you, not only from far away, like the women at the cross—it’s said they looked from far away—but up close, and there’s several things I would like you to share. One of them is—I know that you do some work in Africa with your people; I believe it’s Tanzania. And I’ve heard from others that that’s a very vibrant place with the bishop there. Would you tell us something about your work in Africa? Fr. Steve: Actually, that’s been one of the most rewarding things I’ve ever done in all my years of ministry. St. Paul’s is also very gifted in that Fr. Martin Ritsi, who is the director of the Orthodox Christian Mission Center in Florida, is a son of this parish: he grew up here, and in fact was sent to seminary from St. Paul’s and actually served as an assistant priest at St. Paul’s under the late Fr. Stephanides for about six to nine months before he just could not contain himself any more and had to go out into the mission field. Of course, he started out in the mission field in east Africa. A number of years ago, St. Paul’s had its 25th anniversary as a community, and Fr. Martin Ritsi and his wife and children were there. I wanted to find a way to connect our life as a community with the ministry that he has at the mission center. So one of the things I spoke about that night was, in our vision of the Church, of being Christians and being Christ’s witnesses to the end of the world, that we should engage in building a church in Africa. And I looked to Fr. Martin basically to offer guidance in that, and several years ago we met, myself and some other lay leaders, and he pointed us in the direction of now-Metropolitan Jeronymos of Mwanza in Tanzania, saying that the Church there is very much alive, very much like the New Testament Church in terms of growth, and very much in need of help, because the people there are very, very poor, obviously. So he made the connections for us with Metropolitan Jeronymos, and out of that we established a missions committee, a group of very dedicated laypeople, and we raised in essence about—well, over $75,000, and out of those funds the Metropolitan had chosen a village called Kobunshwi that needed a church, a village of about 2500 people, about 500 of whom are Orthodox, about a quarter of the village, almost—and to build a structure there. So we built the church. We built a home for the priest and his family next door to the church. We’re in the process of having a well dug for the village so that the village has clean water, which is an extremely important thing in Africa. I had some icons painted in Greece for the iconostasis, and they are actually painted in Swahili, which is the language of the people. It’s been a very moving thing. I had about 18 of my parishioners go with me to Africa now on two different occasions. Fr. Thomas: So this church building, whom is it dedicated to? Fr. Steve: Well, it’s dedicated to St. Paul, the Apostle to the Gentiles! Fr. Thomas: Now, the Metropolitan there, the bishop, he’s a native African. Is he a native of Tanzania? Fr. Steve: Actually, he’s a native of Uganda, but was appointed as the Metropolitan of Mwanza in Tanzania. Originally he started out as the bishop of Bukoba, but with the growth in Tanzania among native African peoples of the Orthodox faith, he was actually made the metropolitan of Mwanza. Fr. Thomas: How many African clergy would they have in that church? Would you have any idea? Fr. Steve: I do. They have 166 communities, about 80 actually stone churches built, like ours, and they have about 38 priests, which means that most priests minister or serve two, three, and even four different communities. Fr. Thomas: Do you know, as the president of the Greek Orthodox Archdiocese’s Council of Presbyters, if other churches are doing similar things? Is that something that’s happening? I know that Fr. Martin—and perhaps we ought to mention with a congratulations here the weekend, I believe it’s of Memorial Day weekend, in May, the Orthodox Christian Mission Center will be dedicating their new building. They just moved into it a week ago. It’s being named after Archbishop Anastasios of Albania and Archbishop Demetrios of North America, two old friends, actually. They grew up together in Greece, they both ended up archbishops, and they’re both missionary-minded men. It’s a wonderful building, and a lot of great work is being done by the Orthodox Christian Mission Center, with Fr. Martin, Fr. David Rucker, Dn. James Nicholas, and others who are working there. It’s really a wonderful mission center, doing a lot of good all around the world. Is there further work that you know? Is this sort of an exceptional thing? What can you tell us? Fr. Steve: I think it’s probably been all too exceptional in some ways. There have been other Greek Orthodox clergy who have undertaken to build churches in east Africa. Fr. John Chakos is one, Fr. George Livanos is another; both men are out of the Metropolis of Pittsburgh. Recently, the church of St. Barbara in Santa Barbara and Fr. Simon Thomas, who’s the pastor, the priest there; they have agreed to build a church in a village called Kazinga. They have raised the money for this, and hopefully in the next year that church will be built and we will all go back there for the consecration of that church. I think that Fr. Simon, because he was the assistant priest here at St. Paul’s for a while, got some of that missionary spirit—I hope I can say that—from us and from contact with us. But his own people have a missionary spirit as well, and he does, too, so it’s been a wonderful, wonderful way for us to work together. Fr. Thomas: You also, Fr. Steve, I know are on the board of the Project Mexico. Maybe you could just say a word about that, and also: How do your people feel about you doing these kind of things as the pastor of a very large church with a lot of their own activities? Is it something that is hard to do, or is it something that people generally support your doing and participate in? I think a lot of us would like to know the reaction of your people to these kind of activities. Fr. Steve: I think the reaction actually is very, very positive. For example, with Project Mexico, with St. Innocent’s Orphanage, we tie in our GOYA, our youth group, to going down, to working, building homes, going to the orphanage, interacting with the boys. I’ve had the boys come to St. Paul’s, as a matter of fact, and serve in the altar, and introduced Margaret Yova, who actually preached a sermon to talk about the work of Project Mexico. We have been able to raise thousands of dollars for them. We have at St. Paul’s a ball, I guess you’d say, a fundraising ball, a charity ball, in which we raise money not just simply for St. Paul’s local ministries, but for, in the past, St. Innocent’s Orphanage and also for Kids and Cancer, which is a ministry of the Greek Orthodox Metropolis of San Francisco’s Philoptochos. We gave, I think, a year or so ago, $21,000 to Project Mexico out of that one evening of fundraising. We have given probably $60,000 or more to Kids and Cancer, which is a program to provide summer camp programs for kids with cancer and their families. So I think that it’s a very outreach-oriented parish. We have to do a lot of things to build ourselves up, and we are doing those things, but people are generally very supportive of this outreach. Fr. Steve: I’ve been doing this for a long time. Actually, in Seattle initially, just to give you one example of where Catholics and Orthodox, for example, can work together, the Roman Catholic Archdiocese of Seattle had a homeless shelter in downtown Seattle that served about 300 men a night. And we were able to partner with them—of course, being Greeks, we’re very good at food—and we would go down and serve meals at this shelter. And we had a group of people who committed to do the cooking and another group of people who committed to come and pick up the food and then go down and serve it at the shelter. I think that those kinds of ecumenical things, where we as Christians, even though there are things that divide us, even though there are sometimes very important things that divide us, we still have to bear witness to Christ in a very dark, dark world. Sometimes I feel that we can, in fact, partner with other churches to do those kinds of things, to bring the light of Christ to, really, people in despair. Most of the men in this shelter were either alcoholics or drug addicts, quite frankly, and they were on the streets. But I think here in Orange County, again, I think ecumenical outreach is important because we may not ever have Christian unity in the sense that all churches become one. I think, if anything, that is something, at best, eschatological. But we have to here at least be friends. We have to at least practice loving one another! That’s really, really important. If Christians cannot love Christians, how can we love atheists and Muslims and Buddhists and people of all different walks of life, if we can’t love one another as Christians, at least those who confess the name of Christ? Fr. 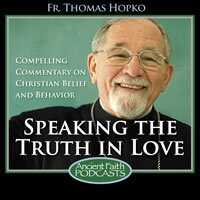 Thomas: Does anyone criticize you for doing these things, internally or from outside or other churches? I mean, because I think what you’re doing is… I think it’s being done other places, but my impression is that your church, because of its size, its prominence, its location, perhaps even because of you and your activity in the Archdiocese, people know about it. What is the reaction of other people outside your particular community? Fr. Steve: Well, I’m sure some people might want to be critical, you know? I have gotten just a few emails from time to time, critical of things that we’ve done ecumenically, working with Roman Catholics or working with Protestants. And I’ll be honest, I mean, there were some people in the parish itself who, when I said, “We really ought to build this church in Africa, we need to do ministry in Africa, we need to bring the Gospel to the ends of the earth,” they said, “Oh, Father, wait a minute! We don’t know if we can go all the way over to Africa!” But I would say once they caught that vision, saw that it was clearly part of the Gospel, they have embraced it and really been the major workers in that. And that’s the thing, again: people have to want to be involved in doing these things, and my job is to give them as many opportunities as possible to do as many good things as they possibly can. Fr. Thomas: Yeah, if I could just make a comment myself here about your interaction and dialoguing and meeting and discussing with non-Orthodox Christians… You know, it’s not a secret that in some circles there are some people who think that “ecumenism” is a bad word: it’s almost a denial of the faith and a denial of Orthodoxy, and I think that this is one place where we would agree, I mean, St. Basil the Great said if you’re the pastor, the head of the community in an area, you’re responsible for everybody who lives there, and if there are people who are not following the Gospel in the way that we think they ought to, we have to meet them, we have to talk with them, we have to respect them, of course, and this is 21st century, not the fourth, which makes it a little more complicated. But I think if people would just understand that there are certain things that are absolutely inherent in Christian faith and that would be not only to love everybody without qualification or condition, but certainly with other Christians, to try to meet them, to speak with them, to understand, even to clarify what the differences are, to see if they really understanding things properly, and try to overcome, perhaps, misunderstandings, even to try to overcome where there are understandings but there’s differences; and then, of course, to work together for God’s glory, in the name of Christ, for the good of people, whenever that’s possible to do so. I would like to just ask about that. How did you get yourself elected president of the Council of Presbyters of the Greek Orthodox Archdiocese of America? Fr. Steve: Well, that’s a good question! There are two representatives from each metropolis that are elected by the clergy of each metropolis. There are nine metropolises in the Greek Orthodox Archdiocese at this point. And I have been on the Archdiocese Presbyters Council for a number of years. I think it’s a really good thing. I think it’s really good for clergy to gather together from all parts of the country, to share ideas, to share what’s working in their communities, to attempt to develop programs for ourselves so that we can continually educate ourselves, continually be—how do I say?—to be better shaped, I guess I’d say, for God’s purposes, for God’s work, by the Holy Spirit. It’s just been a wonderful experience for me through the years. A few years ago I was actually approached to be the president. I’d never held any office on the Archdiocese Presbyters Council before, and I was actually approached to be president, and I said, “Well, I mean… okay, that’s fine. You can put my name in the hat, and if I’m elected, fine, and if I’m not, that’s God’s will and that’s fine, too.” Actually, I ended up getting elected! Now, fortunately, thank God, there are term limits, and so I’ve served now three years as president of the Archdiocese Presbyters Council, and I have a fourth year still to go, but then after that I must step down and another priest must take my place. Fr. Thomas: Could you share with us some of the actual projects or some of the things that you discuss or work on or that you’re doing, as a national council of presbyters? Fr. Steve: Sure. I met with Archbishop Demetrios probably about three and a half years ago, after I was first elected president of the APC, and he asked us to focus on two things. One of those things is clergy family life, that we as priests sometimes feel very conflicted about parish life and family life. In fact, I even heard one priest one time stand up in a meeting and say that he has a mistress and his mistress is his parish, and I think, “Oh my gosh! That’s already a losing battle if he understands things that way!” But I think that the focus has been on family life, encouraging family life, working things through. I mean, when two people get married, even if they’re Orthodox, even if they’re devout, they’re both coming from two very different families, even if they’re both from Greek background, which is increasingly not the case in our Archdiocese—I mean, my wife is not of Greek background, for example, although I am—that there are things that need to be worked through. So we had a retreat, for example, at Antiochian Village in Ligonier. We brought in Fr. Vassilios Thermos, who is a psychiatrist and also an Orthodox priest in Greece, to talk to us about clergy family life and to talk to us about what it means to be a priest, what it means to be a presvytera, what it means to be a priest’s child, to live in sort of a fishbowl in some ways that many other people might not. We had Fr. Michael Kontogiorgis, who is the assistant chancellor of the Archdiocese, speak about misconduct and setting appropriate boundaries as clergy. We had the archbishop himself, Archbishop Demetrios, come and speak about the fact that, in order to be priests, we must first be disciples of Christ; we have to be disciples before we can be leaders, and it was a wonderful talk. We prayed together; we did Liturgy together. We’ve had a couple of such retreats now. Right now we’re in the process of trying to do something for continuing education, which is something that Archbishop Demetrios has asked us to do. And we want to focus on preaching, because, I think—forgive me for saying this—but no one to my knowledge has ever accused anybody in the Greek Orthodox Archdiocese of being a really wonderful preacher, and so we need maybe to work on that, so we’re planning to do this at Holy Cross, at the campus of Holy Cross this coming fall. And we are bringing in, obviously, Orthodox preachers and speakers, but we’re also bringing in people who teach public speaking as part and parcel of their job professionally. We’re really hoping for a good turnout, and we’re really hoping that this will be as beneficial to the clergy as some of our previous programs have been, focused on clergy family. Fr. Thomas: That’s really wonderful. You’ve been a priest a quarter of a century. Maybe I should ask you now, before I continue with my other questions: how do you see that quarter-century, those 25 years? Were there any really striking changes? What did you learn, what did you see in those 25 years? Fr. Steve: I think probably the first thing I’ve learned is how screwed up I am and that I am desperately in need of a Savior. I think that’s probably the first thing. I can only tell you how blessed I’ve been, to meet so many people and to have so many people part of my life, to learn from them, to learn from their joys and their pain and their sorrow and everything else. That has—how do I say it?—it has enriched my life, really immensely. I think in terms of what I’ve learned, I wish there were things that I’m doing now that I had done 20 years ago. There are things that I see now much more clearly than I did then when I first started out and that I really should have tried to have been engaged in early on. I think that if we’re judged by what we’ve done—and certainly that’s what the Lord Jesus says in Matthew 25—then I wish I would have gotten started much earlier. Fr. Thomas: What advice would you give to a young priest? Fr. Steve: Well, now, that’s difficult. I think probably the most… the only real advice that you can give anyone is that you have to love your people, and that is really difficult to do, because most of us as people and certainly most of us as priests, we’re self-centered, egocentric. People come up, they kiss our hands, they bow before us, and all this kind of stuff, and ask for our blessing—but unless when we bless them we really love them, it’s not real; it’s just not real. And we have to make sure that everything we do in our lives is as real as it can possibly be, and that takes discipline; it takes focusing on the Scriptures, focusing on Christ, living the Liturgy. There’s a wonderful, wonderful passage—I wish I could quote it off the top of my head—in this book by the late Fr. Lev Gillet about the priest at the altar and how Christ’s body, we take it and we break it, and he says that’s exactly what needs to happen to the priest. He needs to be broken in order to be Christ’s gift. Fr. Thomas: And what would you tell the young presvytera, the wife of a priest going into a parish community ministry? Fr. Steve: Love your husband, yes, but tend to your children. Don’t necessarily worry about having your own ministry in the church. If that happens, that’s fine, that’s wonderful; if you have gifts as a Sunday school teacher, if you have gifts as a choir director, that’s fine, but you would be those things anyway, probably, even if you weren’t a presvytera. But your main focus needs to be your family and the life of your family and being a witness to your own Christian life within your family, to nurture that and to be sure that that’s… that the home-fires are tended, so to speak. It’s also important for you to help your husband maintain his boundaries, not let the parish life seep so much into his life that it affects you as a family in a negative way. And, to be honest, wives are and should feel that they’re called to set those boundaries with their husbands. Fr. Thomas: If you were going to give a word or two to the people who come to church, relative to their pastor, their pastor’s family, what would you want to tell them? Fr. Steve: The first thing you need to do is pray for him, because if he’s as screwed up as I am, he’s in deep trouble. So you need to understand that’s your first responsibility. I think to support your priest, not in his sinfulness, not in his stupidity, but always if you need to confront him, to confront him in a loving way. I think that we can learn a great deal from our laypeople. I am sometimes just in awe of so many of the laypeople that we have in our communities, how deep their spiritual life is, how rich their understanding of the Scriptures is, how they have lived the faith in ways that oftentimes I feel has put me to shame—and I’m the priest! I’m supposed to be their leader, their example, and yet I find them to be examples to me. And I hope that every layperson would look at themselves as an example of Christian living, and that’s what inspires a priest and keeps him going. Fr. Thomas: Thank you very much, Fr. Steve, for talking with us. The listeners of Ancient Faith Radio, I would tell you, especially maybe there’s some younger priests listening, families—if you’re looking for a mentor, you need someone to talk to from time to time, maybe you need someone just to vent with. Fr. Steve told me that he would be glad to be… [Laughter] He’s laughing, but I think it is true. We bear each other’s burden, and this is how we fulfill the law of Christ. If Orthodoxy has anything that it claims, is that we are a conciliar Church. We’re members, one of another. We have councils of bishops, presbyters; we have deacons; we have the people. We are one body in Christ, with many gifts, many members. I can say, I would like to say to all my friends who listen to the Ancient Faith Radio that there’s wonderful things happening in our communities throughout the country. Sometimes Orthodox people tend to look at the dark side. They look at our difficulties, they may look at our numbers, they may see that we’re dealing with all huge problems on a global level because of all kinds of reasons, but there are miraculous things going on, on the ground in our Church: translation, services, English language, school programs, outreach programs, mission programs, foreign and domestic mission, making Orthodoxy known among other people who are looking and seeking. And this is happening, there’s just no doubt about it. Ancient Faith Radio is even one of the examples. Perhaps God will bless us to use this possibility of being together. One saint of the Russian Orthodox Church, Philaret of Moscow, he said, “It’s wonderful to be together when you’re together physically, and you see each other and you enjoy each other’s company, but it’s most important”—he used the Russian expression which I’ll say—he said, “Dirzhit sebya sobor,” which in English means that you carry within yourself the whole Church, you carry all the brothers and sisters, you carry all the bishops, all the priests, all the monks, all the nuns, and are constantly holding each other up before the face of the Lord. And when that happens, then God really acts and miracles do happen. Fr. Thomas: —but your wonderful people that I know of for a few years, it’s always inspiring, always encouraging, and always edifying. The Apostle Paul, he said—we were talking about St. Paul here these days for the 2000th anniversary of the birth of St. Paul that’s being celebrated—St. Paul, he says in the Corinthian letter about [how] you could have faith to move mountains and give everything to the poor and know all the mysteries and speak in tongues of men and angels, but if you don’t have love, it’s nothing, worse than nothing. But he also said that he wishes everyone would prophesy. We usually think of prophecy as some sort of predicting of the future or clairvoyance, but the Apostle Paul tells us in the Corinthian letter that to prophesy means to do three things: to work for the edification, the encouragement, and the comfort, the consolation of the brothers and sisters. And St. Paul’s Greek Orthodox Church in Irvine, California, its pastor, Fr. Steve Tsichlis, president of the Presbyters Council of the Greek Orthodox Archdiocese in America, that that community is one where many, many people, not only members of the church, but outside, are edified, encouraged, and comforted to observe their ministry. Thank you, Fr. Steve, and God bless you and all your people and your family.